Take a journey to discover The Ancient One Scene and behold its true benevolent energy shape and nature. This is the source behind and supporting all life and all that exists and on a smaller scale we as individual beings are comprised of exactly the same shape and eternal energy. The most spiritually and technologically advanced extraterrestrial races refer to this source as Prime Creator. The truth revealing depth of this trilogy adventure awaits your exploration. This will benefit you in ways you cannot yet imagine. 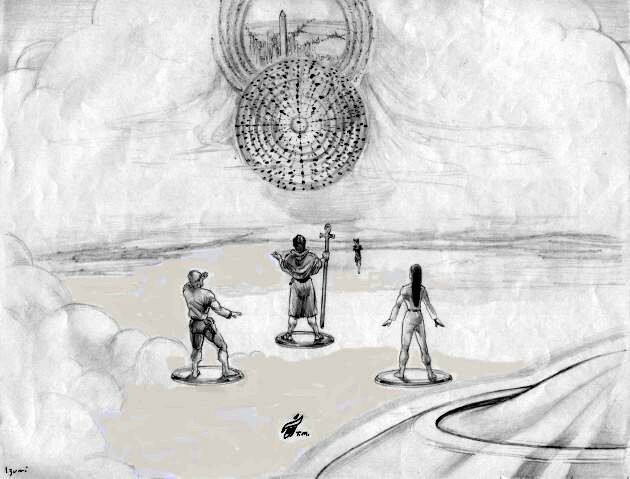 Scene – Ra Mu introduces Kalem, Mayleena & Etta to The Ancient One. When Master Ra Mu introduces Captain Kalem, Mayleena, and Etta to The Ancient for the first time their lives are consciously deepened with new awareness in ways they could never have imagined before that moment in eternity. The Ancient One shown here actually traveled down many dimensions and then through an inter-dimensional opening to be of benefit to them in their physical human forms in the sky above ancient Earth 100,000 years ago. Note: Thank you for reviewing The Ancient One Scene. To revisit character sketches for the lovably courageous Etta from the Dren race, Mayleena, Captain Kalem Starland, and Kalem’s Scout Ship Control Room select a link below.